Crewe Alexandra striker Marcus Haber says that the threat of relegation from League One is helping the club's young players grow up fast. Saturday's 2-0 win at home to Rochdale, their first in two months, followed three draws and they are now four points off safety in League One. "Experiences like this will only make it a better experience for the young lads," Haber told BBC Radio Stoke. "A lot of them are growing in maturity as the season goes on." Having spent most of the season at the bottom of the table, Crewe now have the psychological tonic of seeing two others teams beneath them. They need to climb two more places by season's end on 8 May to complete a third successive escape. Haber admitted that a lesson learned from the last time they had found themselves two goals up, when they led 3-1 at half-time at Swindon last month, but lost 4-3, helped them against Rochdale. "We thought back to Swindon," he said. "We've played some good stuff this season but at end of games we've switched off and given away a lot of points. "We've given things away too often. We've not been good at closing games out. It's not so much about having ability, it's about having grit and playing smart. In sport, you have to grow up fast." 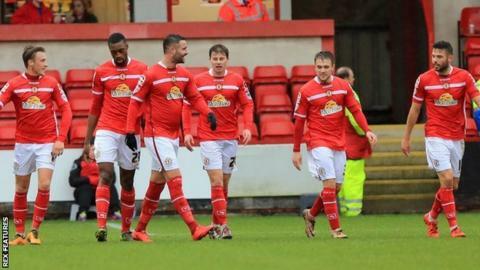 Crewe's ultimately comfortable victory was the first time they have scored more than once in a home league game since a 3-3 draw with Bury way back in August. Brad Inman's fifth goal in as many games made him the club's joint top scorer alongside Ryan Colclough, who departed for Wigan Athletic on deadline day. Next best is Haber, whose opener against Rochdale was his first league goal of the season at Gresty Road. Apart from a goal he scored in the Johnstone's Paint Trophy, all his other strikes this season had been in away games. On top of an upturn in results, Crewe have received a major off-field boost with club captain Harry Davis, the Alex manager's son, returning to training for the first time since injuring his knee at Walsall in September. The 24-year-old now has a chance of being back in the side by the end of February. "We'll have to take things steady with Harry and build up his fitness," said his father, Steve. "He has been out a few months and will need time. But we are confident he's on course to be available towards the end of the month."